I’m a mama of three little boys. Back when they were still tiny babies, I used to dread the day they start running around and getting all sweaty and dirty because I don’t like smelly kids! Well, at 7, 5 and 3 years old, my sons are well past that day. In fact, they spend all day running around, rolling on the floor, jumping about, and chasing each other and their classmates. They get sweaty and they get dirty but they don’t get smelly. Ever! Kids need to be active (and sweaty) to be healthy. I like to think it’s genetics (I don’t have body odor) but since they're still kids, the reason simply is they don't have the factors that plague people prone to B.O. Puberty hormones, obesity, regularly eating spicy food, certain medical conditions like diabetes (bacteria like the sugar in their perspiration)—one or all these things can cause body odor. Sweat itself is just water so it doesn’t smell. But bacteria found on our skin just love our sweat and so the more bacteria you have, the smellier you get. So the solution is really simple—Get rid of bacteria! Baths are important, of course. Fresh clothes at the ready when the boys get sweaty. And I also use antibacterial everything on my kids—their soap, their hand gel, pocket-sized spray bottles of alcohol. Since we can’t prevent sweat, I can just keep bacteria at bay. My little helpers also love doing the laundry. I even use antibacterial laundry products! 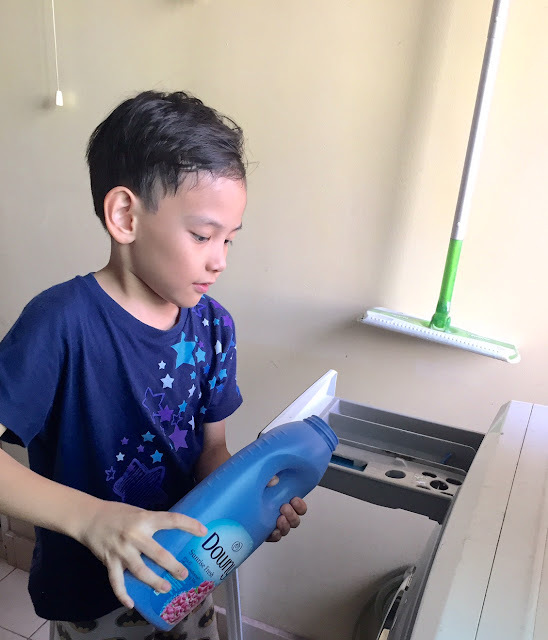 Diba I said my favorite household chore is doing the laundry? Well, ayan, my bacteria-aversion has made me choose products like Ariel AntiBac and Downy AntiBac. I like how it prevents 99% germs from making me and my boys smell yucky. No bacteria, no smell. I’m confident that even when my kids play all day, mabango pa rin sila pag-uwi nila sa bahay. Love it! P.S. I confess I tried the Parfum Collection lately and my whole family smells sooooo good!